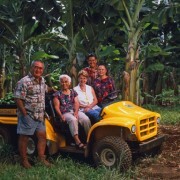 Hamakua Springs Country Farm is a multigenerational farm operated by the Ha family. They started out as a chicken farm back in the day. Since then they’ve transformed numerous time – bananas, tomatoes, and now a energy efficient and community building model for farming. We’re including a bit about their farm from their fantastic and informative website. Be sure to check out Richard Ha’s blog HaHaHa – for insightful explorations into food, energy and community! “At Hamakua Springs Country Farms we are still—first and foremost—a family business. And a dedicated one. We’ve been in the banana business for 30 years, and now three generations of our family are researching, developing, growing and selling not only bananas, but also the best-tasting varieties of tomatoes, lettuce, cucumbers and watercress we can find. We know that if it doesn’t taste great, customers won’t come back for more. So when we’re researching new products to grow, taste is our highest priority. We get an amazing 130 inches of rainfall per year here on the Big Island’s Hamakua coast, and we’ve found ways to make all that water an asset. We’re excited about using our farm’s readily-available resources to keep expanding into ever more diversified agriculture. We have other products in the works coming soon. You can find Hamakua Springs Country Farms produce being served at many fine dining restaurants and resorts in the islands. They can also be found at retailers such as KTA and Foodland.